Leyland Motors, based in Leyland, Lancashire, had been noted for their steam and petrol engined vehicles, and had entered the luxury car market. By 1922, they had suffered large financial losses, but their entry into the motor bus market started their recovery. 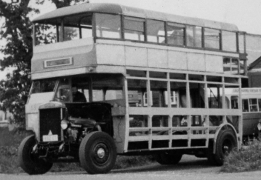 In 1926, Mr G J Rackham was appointed chief engineer to the Company, and his design of double deck bus, the 'Titan' TD1 was a major advance on any previous double deck buses, either Leyland's own 'Leviathan' of which only 98 were built, or from any other manufacturer. 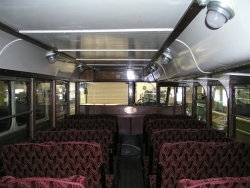 The new model was unveiled at the 1927 Commercial Motor Show, and it created much excitement with its low frame height, allowing much easier boarding and alighting than earlier models, and the introduction of the "low-bridge" style of body with an offset top deck gangway allowing double deck bus operation to be possible where there were bridges as low as 13 ft 6 inches. 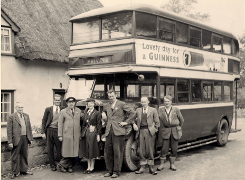 A much faster, smoother and quieter ride (partly due to the adoption of inflatable rather than solid rubber tyres) and a much improved level of reliability was offered by this new generation of buses. Power was provided by a 6.8 litre, overhead camshaft petrol engine, with a 'heron' head combustion (the combustion chamber is in the piston rather than the cylinder head.) Drive is through a 4 speed sliding mesh gearbox to an offset rear axle. Lincoln Corporation were one of the first transport operators to sample Leyland's TD1 'demonstrator' in 1927, and promptly placed an order - Leyland's first production 'Titan' becoming Lincoln Corporation No. 24 (FE 9755) in 1927 - 9 more Titans followed to replace Lincoln's trams in 1929, following the advice in a Leyland advert of the era to "bury your trams - mark the spot with a Titan." 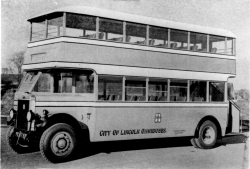 Lincolnshire Road Car also introduced double deck operation to their fleet with Titans in 1930. While most of Lincoln's TD1s survived until the 1950s, sadly none survived into preservation. Lincoln Corporation continued to buy later generations of the Leyland 'Titan' until the 1960s. WH 1553, No. 54 was one of a batch of Titans new to Bolton Corporation Tramways in 1929, the year that Bolton's growing motor bus fleet moved into a new garage. 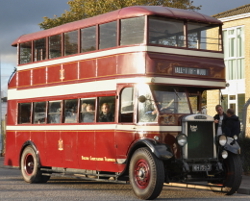 While retaining its urban tram network until 1947, Bolton Corporation was quite active in developing longer distance bus services, some in co-operation with Lancashire United Transport and Ribble Motor Services - Bolton's buses reached the west coast at Southport, and went inland to Manchester and Hyde. 7 years was then considered to be the service life of a bus, and in 1936, Bolton sold 4 of its Titans - WH 1551 to 1554 to Hicks Bros. of Braintree, Essex, and were numbered 51 to 54, matching the registration numbers more neatly! Hicks' fleet livery was dark blue with yellow bands. No. 53 (as it was now) was mainly allocated to the garage at Silver End, to operate the Braintree - Silver End - Witham route. All the ex Bolton Titans were re-built during their time with Hicks', and had their platforms enclosed. All except (Hicks) No. 53 were fitted with Gardner diesel engines and stayed in the fleet long enough to pass to Eastern National, who acquired the Hicks' business in 1950 (WH 1551 and 1552 stayed in service until 1954). However, in 1947, WH 1553, still with its petrol engine, was sold on to Messrs Honeywood of Stanstead, Suffolk and continued in service, in a chocolate and cream livery, mainly on services to Bury St Edmunds and Sudbury, until 1956, by which time it had covered 900,000 miles. In 1958, Messrs Goldsmith of Sicklemere acquired the business and fleet of Honeywood's, by which time WH 1553 had escaped disposal for scrap following the intervention of a former Hicks' employee, Mr John Farmer, who persuaded Leyland Motors to acquire the bus for posterity. The photograph of WH 1553 with Honeywoods has recently been sent to us by Colin Garwood, son of the late George Garwood who was senior driver with Honeywoods. The picture was taken after its last run on October 23rd 1956, outside "Shelley" the residence of the proprietor F J Honeywood, the yard and bus garages were adjacent. The cottage still exists (and is a listed building) but houses have been built on top of the yard, over the petrol tank. From the left - F J Honeywood, George Garwood, George Jarmin, who was retiring at the same time as WH1553, Lily Farrance, Ernest Sparkes, Peter Maxim, Reginald Mortlock. Peter and Reg had been on bus washing duties that afternoon and were not prepared for a photocall. A larger version of the photograph is on our Flickr site. front seat passenger's eye view at our November 2010 Open Day event - video by d33206hg on Youtube. 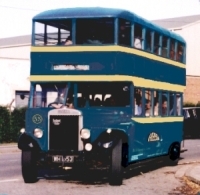 After a few years with Leyland, which included an appearance in Wallasey, disguised as a Wallasey Corporation bus, the bus was donated by Leyland Motors to the LVVS in 1965, and a full restoration was planned - there was some support for the proposal to restore the bus to Lincoln Corporation colours as a replica of Lincoln's own TD1s, none of which survived. 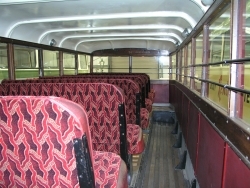 By this time the bus was in relatively poor condition, necessitating the most ambitious and extensive restoration project undertaken in the early years of the Society. Much of the body frame was rotten and had to be replaced, in addition to which the staircase was rebuilt to the original open layout. Newly restored, the bus made its rally debut on the 1970 London to Brighton Run. Initially, it was restored as 'Bolton 53', the (Hicks') fleet number 53 having been found on stripping paint. The correct Bolton fleet number (54) was later applied! The bus has shown no inclination to retire, despite its advancing age - a limited number of rallies are attended, and a few passenger journeys are usually operated on the Society's Open Days. 2001 saw the centenary of Bolton Corporation Transport, and No. 54 was loaned to the Manchester Museum of Transport for part of the year, and took part in a number of special events, including a visit to Blackpool to be reunited with the only remaining Bolton tramcar. No. 54 was also the pattern for EFE's scale model of the type, the first livery available being Bolton Corporation. Any more information about WH 1553's time with Hicks, Honeywood or Leyland Motors would be appreciated, as would photographs of these stages of its life. We are grateful to the Essex Bus Enthusiasts Group and MW Transport Publications of Essex for informing us about the Essex years and to Mr Colin Garwood for the photograph and clarification about its time with Honeywood's. April 2012 - New inlet and exhaust manifold gaskets have been fitted. The bonnet top has received attention, with a dent removed and is being repainted. April 2014 - This bus has been sent to the Lincolnshire Co-op transport workshop to try and rectify the heavy steering and repair a faulty brake cross shaft.